Laminated automotive windshields are made of two panels of glass sandwiched over a PVB interlayer for safety. The PVB bonds the glass together and is less likely to fall apart if hit by an object such as a stone. Most windshield damage begins as a single impact point on the outer pane of glass. The damage you see is trapped air inside the glass panel between the outer glass pane and the PVB. A Windshield Repair is a structural bonding of the glass by replacing the trapped air with a liquid resin (adhesive) reducing the chance of the damage spreading. It is also a cosmetic fix that will typically improve the overall appearance of the damaged area by 75 to 90 percent. It is important to understand that most completed repairs are not invisible; rather you will see some remnants of the damage as a blemish. When should the repair be done? Windshield damage should be repaired right away. If left alone the damage could easily spread across the windshield affecting the integrity and safety performance of the glass. Most windshield damage starts with a spider looking break. If it has cracked beyond that point the damage may not qualify as repairable. Can you repair a windshield on any part of the windshield? A windshield repair cannot be completed in an area described as the “driver’s critical vision area.” This is in direct forward sight of the driver and could cause a distraction. Repair is also not possible within one inch from the edge of the windshield. Typically a single repair takes 30 to 45 minutes per break to complete. Is there a warranty with windshield repair? 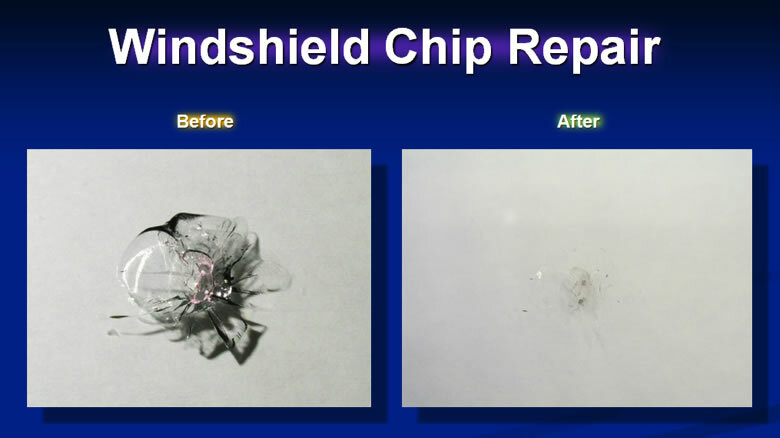 At Richardson Glass Service we guarantee our windshield repairs to never run or crack from the original point of the repaired area for as long as you own your vehicle. If the repair fails, Richardson Glass Service will apply the cost of that repair toward the replacement cost of a new windshield installed at one of our locations. Note: Due to inherent stresses in curved windshields and the varying locations on the windshield where the damage may occur, some breaks are more susceptible to running out than others. If the break is unstable it may get larger during the repair process. If it grows only slightly, a good repair may still be achieved. If it grows substantially, it may cause the break to become too large to repair. This outcome is always a possibility and one that Richardson Glass Service cannot guarantee against. If this occurs there will be no charge for the repair but the windshield will need to be replaced at current replacement rates. First loose glass particles are removed from the damaged area. Next a repair machine chamber is placed over the area and a specially formulated liquid resin is placed inside. A low pressure constant vacuum is then applied to remove air from inside the break to allow r oom for the liquid resin. After this de-airing process is complete the resin is allowed to flow down into the break filling in the damaged area. When the fill is complete an ultraviolet light is applied to cure and harden the resin. Excess resin is then cleaned off and the area is polished to restore the smooth glass surface. 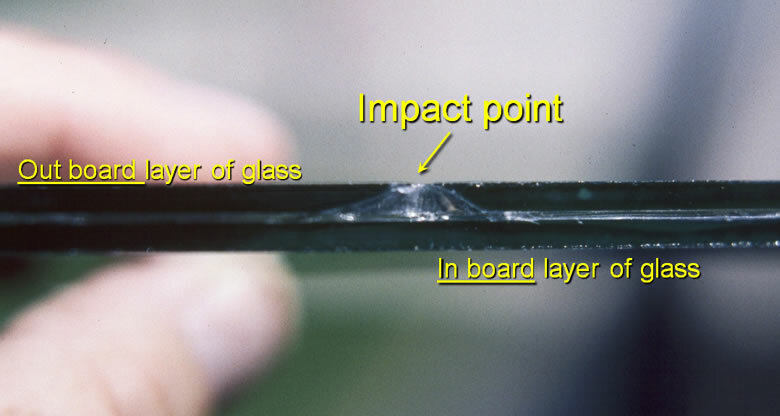 A cut-away of a windshield down through the center of a stone chip. What you see is air where the chip has broken away but cannot fall out due to the inboard layer of glass.